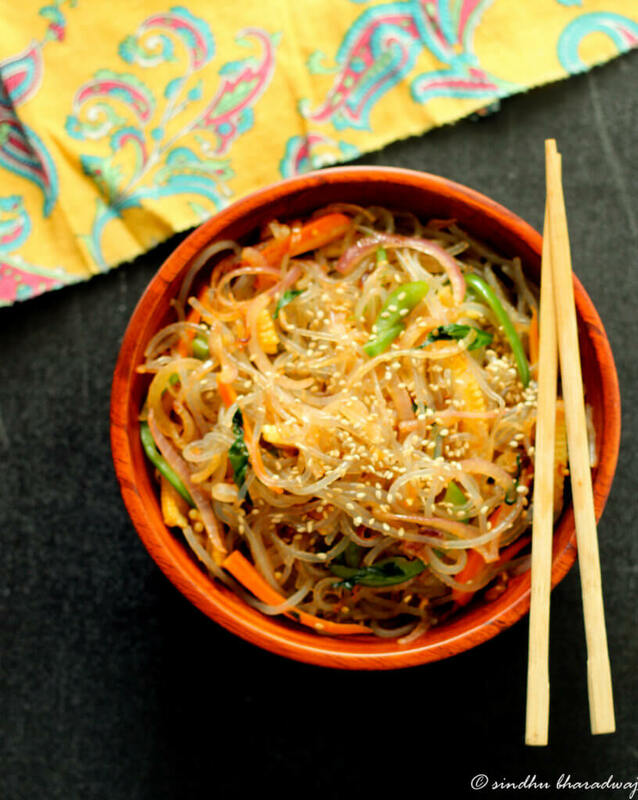 This classic Korean Japchae Noodles (sweet potato noodles) is a popular Korean delicacy that has a melange of stir-fried vegetables, with a savoury sauce. When I first heard/wrote about Japchae while I was working for my client (have written so much about Asian cuisine that I can probably hold a P.hd in authentic and modern Asian cuisine :P) back in my office days, I used to wonder what it tasted like. I was curious as hell! Then, after a successful campaign the client decided to send us all a huge goodie bag of Asian products which also had these sweet potato noodles. 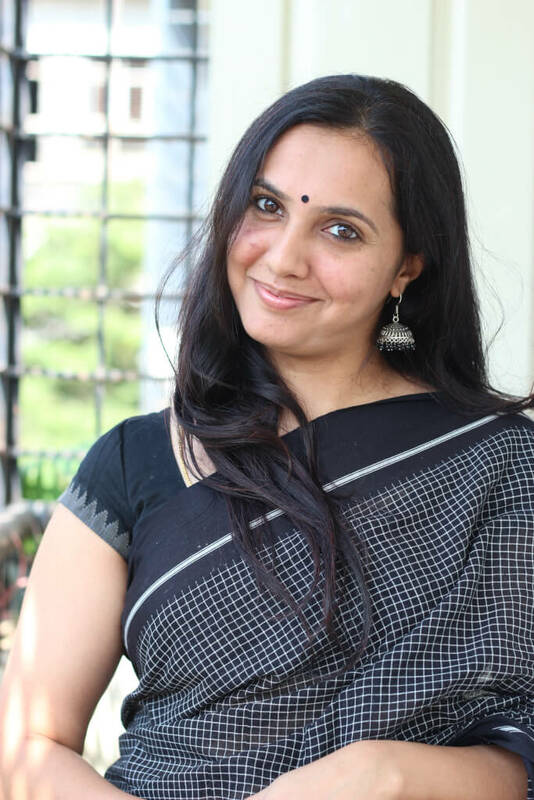 It is no different from our (seviya), just that it is made from Sweet potato starch. 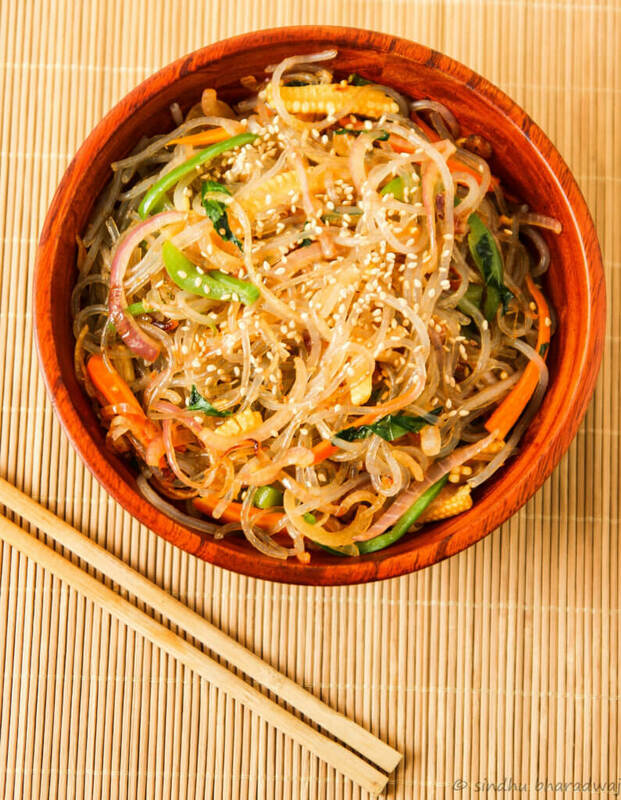 It is also known as Korean glass noodles and it means – jap meaning “mix” and chae meaning “vegetable”. Sweet potato is a healthier option compared to other noodles as it is rich in fiber and lesser carbs. Japchae is chewy in nature and is kinda pale grey in colour. 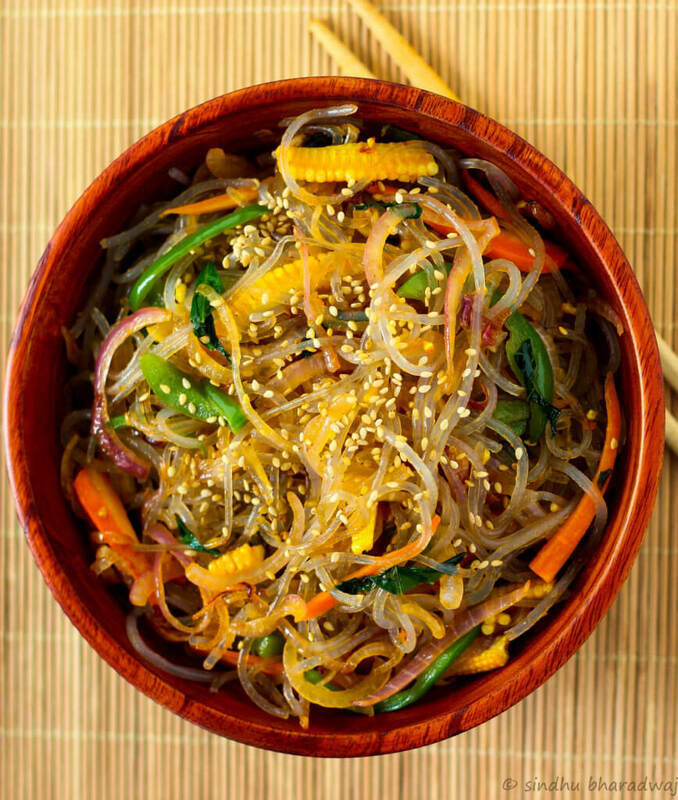 It is typically prepared with dangmyeon, a type of cellophane noodles made from sweet potato starch. You could find these sweet potato noodles at places such as Foodhall, Nature’s basket or Asian food stores that sell gourmet stuff. The best bet would be to get someone to carry it for you if they’re coming from US, AU or any other South East Asian country. 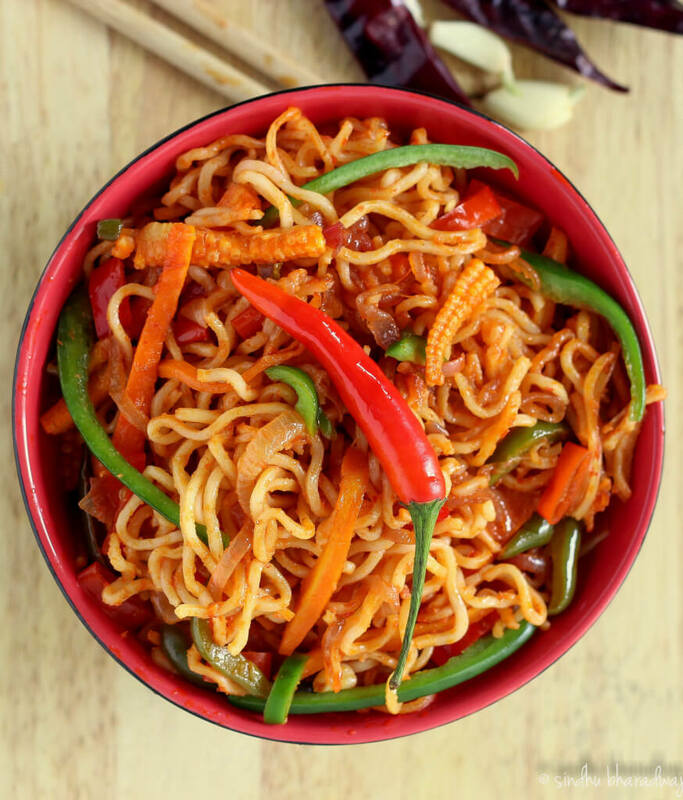 Of course there’s no substitute for sweet potato starch noodles, however, if you have no access to any of these special food stores in India, you can buy the sweet pototo noodles here if it is in stock. 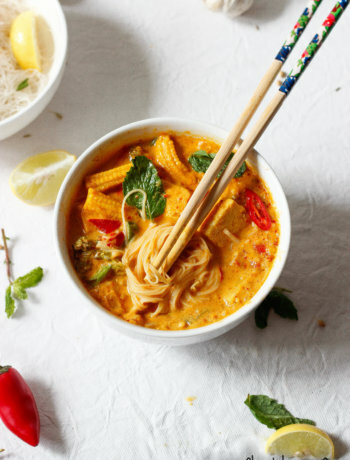 Or you could use Thai rice/glass noodles which is again a good option. 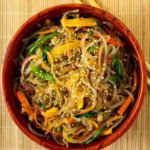 Japchae was once a royal dish in the Korean cuisine. Now it is usually served on special ocassions such as weddings, gatherings and birthdays. It was also a side dish (Banchan) earlier. The Koreans take their side dishes (Banchan) very seriously as they have various health benefits and the process of making them involves fermentation in earthen pots. There are at least 300 different kinds of Kimchi that you could find in the Korean cuisine. So much about Japchae and Korean cuisine happened right? 🙂 I absolutely LUUUURVVV Asian cuisine after Indian because of the diversity and also, for the fact that most of their customs are similar to our culture(Esp Thailand, Malaysia and Indonesia). To begin the preparation of Korean Japchae Noodles, cook the noodles as per the package instructions. Strain and keep it aside to cool. In a pan heat oil, add the onions and garlic. Saute till they turn light pink. Next add carrots, bell peppers, baby corn, spinach and toss until they’re slightly tender. Add the soy sauce, salt and the cooked noodles and toss again gently on low flame. Transfer to a bowl and season it with sesame seeds. 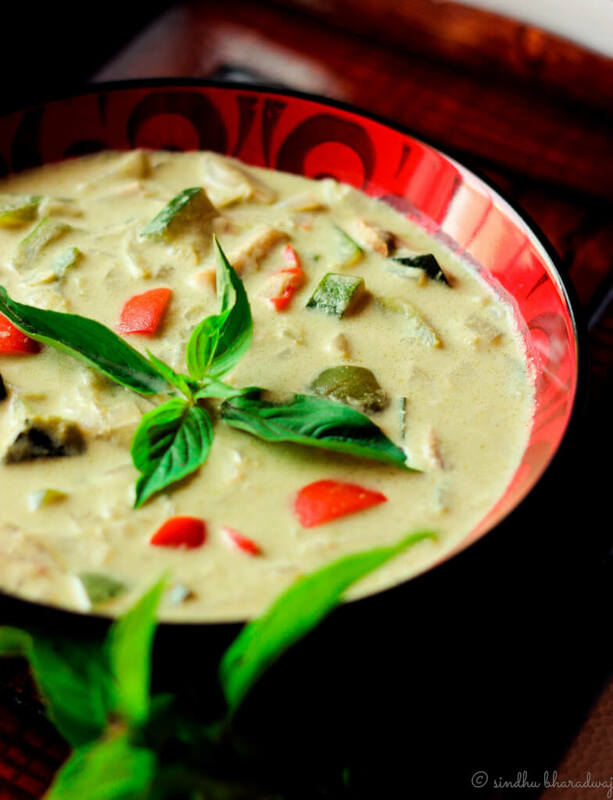 Serve it warm with soup or salad. Ensure that you add a lil less salt to this, as soy sauce already has salt in it. You can also add basil instead of spinach for a flavour burst. This is one of my favorite Korean dishes. So easy to make and so delicious.